Maps and Trivia: Who Could ask for More? November 5th, 2018 by Park County Travel Council | Be the first to comment! There are a couple of things (maybe more, just saying) about me that my friends like to tease. her friends what I had shared. She doesn’t tease me anymore, and we always get a good laugh. A second quirk I have is that I love looking at maps. I get this from my dad who would spread out state and national maps on the kitchen table where he would plan a route for our vacations or holiday visits. The two of us would have deep discussions about tolls, speed limits, timing and such until we agreed on our best route to get two states over. One of my friends spotted an item the other day and forwarded it knowing how much I would appreciate it. 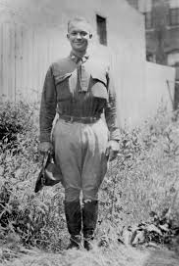 Lieutenant Colonel Dwight Eisenhower in 1919. 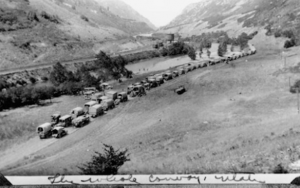 Next year marks the 100th anniversary of a 72-vehicle caravan that crossed the country on a mission to evaluate the state of our roads. Led by Lieutenant Colonel Dwight Eisenhower, the crew averaged five miles per hour and often dealt with poor conditions that required moving obstacles and pulling vehicles out of mud and sand. Many of the roads here in Wyoming were better suited for horses than cars, which is kind of appropriate, if you ask me. I knew that as president in the 1950s Eisenhower signed into law the creation of our interstate road system, but I was clueless about his fact-finding trip more than 30 years earlier. Cody is located on the longest road in the United States. US 20 stretches 3,365 miles from Newport, Oregon to Boston. US 20 runs roughly parallel to Interstate 90 which is the longest interstate in the country. The “0” in 20 indicates that this road goes from coast to coast. US 20 at one time ended at the east gate of Yellowstone National Park but was extended in 1940. Like the interstates, US routes with even numbers are east/west roads while odd numbered roads are north/south. Unlike the interstates, US routes are numbered in descending order from west to east and south to north. Our East Coast friends are not far from US 1 and I 95 while the good people of western California, Oregon and Washington often travel US 101 and Interstate 5, or “The 101 and The 5,” as they say in California. 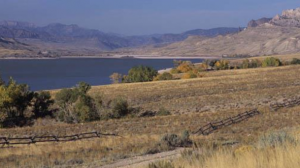 There are three US routes in Cody – 14, 16 and 20 – but they run concurrently through town and to the park. Some of the most spectacular drives anywhere are found near my house. Okay, I already knew that last item and cannot pass that off as an obscure fact. I just wanted to remind everyone that you can look at a map all day, but you still need to get in the car and see things in person. The Buffalo Bill Scenic Byway runs west of town. Until next week, I am lovin’ life – while glued to the map – in Cody Yellowstone.